Scores of specially trained dogs have been deployed as lifeguards on Italy's busiest beaches this summer. 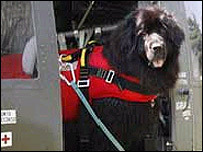 The dogs, mostly of the Newfoundland or Labrador breeds, are trained to jump out of helicopters and boats and swim to the rescue of struggling swimmers. They are credited with having saved several lives by taking lifebuoys to swimmers and towing them to safety. Tales of the Newfoundland's legendary aquatic ability prompted Italian officials to train them as lifeguards. "We always knew that these dogs could be used to fish, rescue people," Ferrucio Pilenga, president of the Italian Dog Rescue School, told the BBC News website. "We began to try what these people did," he says. "The dogs helped us modify and improve our methods." "It was a great satisfaction to see that these myths were true," he says. The dogs are trained at 10 schools around Italy. Roberto Gasbarri, a president of the Tyrrhenian Dog Rescue said it takes "about three years to train a dog completely". "A good relationship with the handler is fundamental, especially in the water," he told Italy's Ansa news agency.